← Life, Liberty & … Death to the Little Ones?? This was my 1st ‘Rose in the Rubble’ photo (the rubble background is actually construction materials for the school)… i made a card out of it & then framed a few copies for my family (this is actually a scan of a blown up version given to my parents, as the original was lost somewhere in transit!) 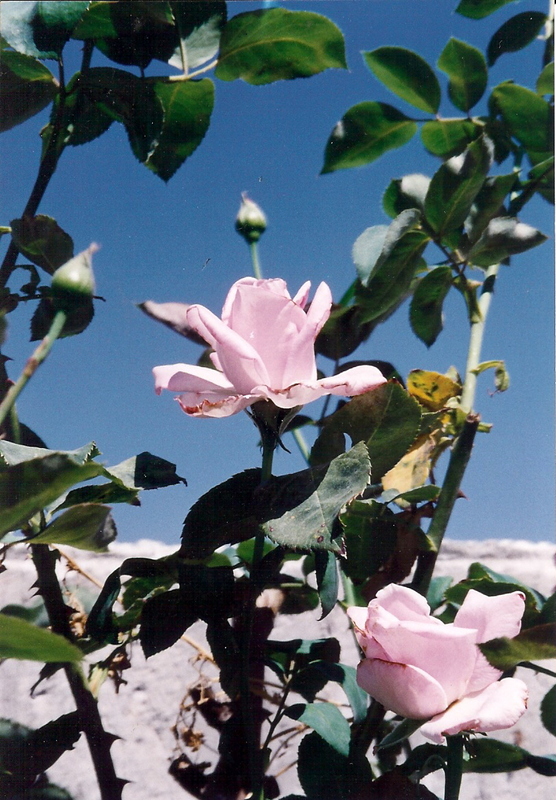 When starting this blog, i chose this pic because these Ibillin roses inspire….as the Living Roses there continue to! This entry was posted in SNAPSHOTS & WHATNOTS and tagged Abuna Elias Chacour, Galilee, gaza strip, Ibillin, Israel/ Palestine, Israel/Palestine, mar elias, Mar Elias Schools, Melkite Catholic, prayers for peace, roses in the rubble, SNAPSHOTS & WHATNOTS. Bookmark the permalink. CAROL- so glad we met in Ibillin & SO grateful to God for your friendship & all those wild-n-crazy times in Gaza (& environs) that made the 1st year with WVJ survivable(!) Will never forget our climb up Mt. Sinai (!) diving the Red Sea (!) dodging bullets & stones that New Years day in Gaza (!) & that special Christmas with you & your family in Poole = LOTS of memories!